Once again, let me stress the importance of available or accessible bedrock in underwater gold sniping. This is true whether you're using a "snipe" tube and working shallow water or working deeper water using a wet suit, face mask, snorkel, and weight belt. Bedrock is the fundamental key to success in all sorts of "gold" sniping endeavors, even if you never set foot in the water at all but prefer to "snipe" above the waterline. Here's a qualifier for you though: You don't necessarily need exposed bedrock (although that's perfectly fine) as long as the overburden covering bedrock is shallow enough for you to remove easily and quickly by hand (or foot, for that matter). 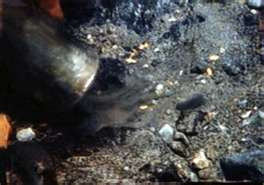 The main idea with using a "snipe" tube or underwater viewer is to spot placer gold where it has come to rest on some sort of impermeable layer (clay or bedrock) or where it's been driven into bedrock cracks, crevices, irregularities, or dumped downstream of small drops offs or behind obstructions like boulders sitting atop shallow bedrock. As I said before, the "snipe" tube enables you to see into and through the water clearly in a manner not possible with the naked eye and even slightly magnifies what you do see. Now you probably won't spot visible gold with each pass of the "snipe" scope, but what you will be able to see are the small cracks and crevices packed tightly with rock, gravel, and black sands of various sizes. Once areas like these are identified, I suggest you use what I call a "layer-by-layer," "pass-by-pass" approach to your sniping. 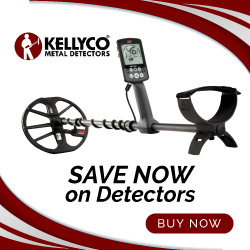 This approach involves removing a small amount of overburden gravel or crevice material and then "sweeping" the immediate area where you've removed this material using your underwater viewer or "snipe" scope to spot any gold that may have been uncovered. Repeat this process again and again until you've cleared bedrock surfaces or cleaned out crevices thoroughly. Now you know what I mean by using a "layer-by-layer," "pass-by-pass" approach. For better or worse, one thing I've been accused of in my mining endeavors is that I am too methodical or deliberate. That said, I think using a systematic, logical approach to underwater gold sniping or sampling in general is an asset...not a liability. But hey...that's me...not you. There's more to come so stay tuned. Good luck in the interim. 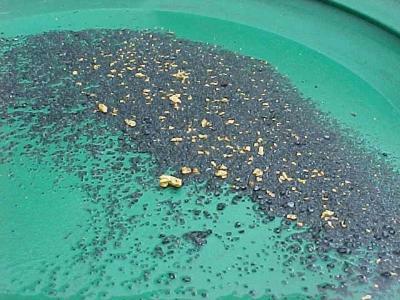 If you liked this post, you may want to read: "Gold in the Northwest: Washington State"
Hey J.R. Putting our home and property up for sale next month and moving up to Tehama County we'll be closer to the gold claims. Thanks for all of your information on the blogs and your website. Good hunting and hope to see you in No. Calif. soon. Hi Len...good for you guys! I wish you all the best in Tehama and the N. Motherlode. Hope to hook up with you sometime as well. Good luck! J.R.